The Wall Street Journal is reporting that Samsung is gradually reducing its compact camera production at its factory in China and replacing that with mirrorless camera production. To put that in perspective, IDC reported in 2010 that Samsung held fourth place in the global camera market (~11% share, which represents over 10 million units) mostly through compact cameras. Meanwhile, as Reuters reported earlier this year, Samsung only sold 120,000 mirrorless cameras in 2011. Obviously, Samsung thinks a major change is afoot. Certainly so. Kodak, which held a 7.4% market share in 2010 is out of the business now. Both Olympus (6.1%) and Pentax (1.5%) have said that they'll de-emphasize their compact lines in the future. So let's just play a little statistical game for a moment, shall we? If the overall compact market declines 10% but Kodak is gone, Olympus and Pentax pull back by half and Samsung by a quarter, doesn't that open up a "hole" that others will step into? By my count, yes, it does, by at least 5% of the market. Most likely Canon, Sony, and Nikon (#1, #2, and #3 respectively in overall camera sales) will gladly step in to fill that hole. The issue isn't market share, it's profit. Some analysts believe that only three of the top ten camera makers actually show a profit on their compact camera lines. In recent financial filings, we've seen three of the ten specifically claim losses in compact camera lines and two others of the ten claim market share loss. In a flat or declining market, holding share and restoring profit is nearly impossible. Something's got to give. But don't expect to see a huge Samsung mirrorless push here in the US because of their announced shift. The primary thrust of their initial change in tactics will be centered on Korea, China, Hong Kong, and Taiwan. I first wrote about the strong need for a shift in compact camera designs in 2005. We're now well into the period I foresaw, and we're starting to see casualties (Kodak) and shifts in strategy (Samsung, Olympus). That said, I didn't predict that compact cameras would go away, only that they would be squeezed by smart phones and DSLRs in ways that would require a complete rethink of the product in between. 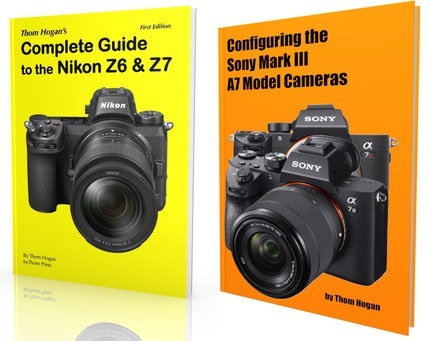 The current group-think by the camera companies seems to be that mirrorless (the mini-DSLR) will replace high-end compacts, but I don't actually believe that to be completely true. Mirrorless is just as likely to encroach upon low-end DSLRs, I think. Compacts are a tricky design problem because they're being squeezed in so many directions, but that doesn't mean that there isn't a demand for a pocketable and competent camera. Update: I had forgotten Samsung's statement in 2010: "determined to be #1 in mirrorless..by 2012" and "best-selling camera brand by 2015." At present, they're #5 in mirrorless and #4 in cameras, but they're also starting to transition out of the cameras that make them #4 (compacts). Compare this to Nikon, who expects to sell more compacts and gain market share in 2012. Moreover, they're almost an order of magnitude behind being #1 in mirrorless at the moment. Not that Samsung's been the only company to make such bold statements of future progress. Virtually all of the camera companies have proclaimed that they'll achieve 20% or higher share in various camera markets. Sony and Pentax in DSLRs. Panasonic and Fujifilm in overall camera sales. The list of these "we'll be a leader" forecasts is nearly endless. I think I'm going to have to imitate John Gruber and institute a Claim Chowder list. Update 2: a week later, Engadget reports that they've talked to a senior VP who said they simply made manufacturing adjustments to build NX models. Sounds a bit like gobblygook to me, and doesn't exactly contradict the original Wall Street Journal statement. Again, I'll point out that #3 (overall camera share) Nikon is increasing compact camera production and expects to gain market share, while #4 Samsung has apparently removed some compact camera production, even if temporarily.